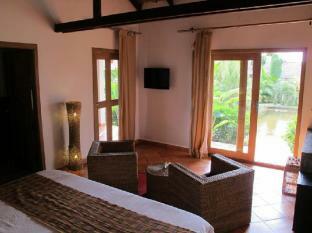 Nature’s Garden Resort is located in selected-seaside town of Kep, on the Cambodian coast. The Resort is a short distance from city center and Crab Market which take 15 minutes by driving. The swimming pool where you can find the poolside that presents you at hours cocktail menus, wine selection and cool drinks which you can take comfortably settled in armchairs or near your sun bed, whereas in the evening, the barman receives you for a last glass in a lounge and greeting atmosphere. Surrounding by fresh ingredients from plantations in Cambodia, treat yourself with healthy and tasteful dishes. Located is not very far from Kampot town and Vietnam-Ha Tieng Border, the resort offers 18 private bungalows allow you to immense in the lush tropical garden of more than 15 000 m2, with exotic species and an organic kitchen garden. Sophisticated and tastefully decorated, this resort has many hidden spots brings out serene and relaxing atmosphere, whether it is several ponds of water filled with lotus waiting for you for a moment of relaxation, a terrace in the opened restaurant near to the swimming pool or in the gardens or the spacious rooms open onto a private terrace with garden view. To host private events, weddings, parties, and fashion shows. 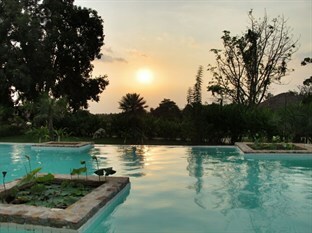 Not only that, the sundeck of the swimming pool can be transformed to a venue upon your request. Each bungalow is given flower’s name that you can find it in the garden and choose the most suitable flower for your stay at Nature’s Garden Resort. Children 0-4 year(s) – Stay for free if using existing bedding.